One morning, my mum and I were going to meet for breakfast. We wanted a nice place, but nothing too fancy, so I decided on Stone Mill Bakery in Greenspring Station. I have already forayed into their world of Hot Chocolate, and was transported to heaven, so needless to say I had high hopes for breakfast. 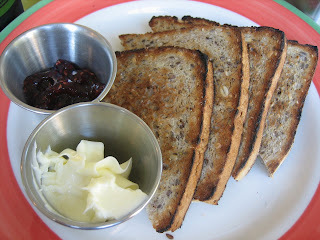 For some reason I decided to order their house made artisan bread with butter and red raspberry jam ($3.59). I still do not understand why I ordered this since I literally have this for breakfast EVERYDAY at my own house. But I have it everyday because I love it so......right. The bread was great, quite soft and chock full of grains. I thought this was great, even if I do have it all the time at my own house :) I also ordered an iced coffee and a blueberry muffin to go (for Dan! I like to buy him delicious surprises!) They don't carry simple syrup (which surprised me) so I asked to have the iced coffee plain, and was happy to find out that it had such a great flavor that I really didn't need to mask it with sugar or cream. The blueberry muffin was huge and yum, with a lovely crumb topping. My mum ordered the fruit tart and a freshly squeezed orange juice (which was a VERY good size). 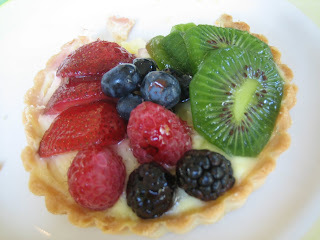 My mum really enjoyed the fruit tart (which is much bigger than the picture makes it seem). I tried it and loved it, as I usually do these sorts of things. Now here is where I have my gripes. This entire order cost $20, including tax. I have no idea what anything cost, except my $3.59 toast. Why isn't the iced coffee or orange juice price listed on their menu? I realize that the fruit tart probably isn't always a menu item, but at least there could have been a sign on the case. I didn't mind paying for it , but when places don't list the price of things, it really bothers me. Anyway, that being said, this bakery is a really sweet place to go if you just want to pop out for a nice and quick breakfast. The employees were incredibly friendly, especially the man who took my order. He seemed so genuinely excited about all the menu items, that it was hard not to feed off his energy. I would definitely come back, and hopefully order something different! But I'll get the iced coffee again, for sure. Just stopped in there Saturday for the first time. Just got iced tea, so I plan on going back to eat, but I agree - where is the drink menu?! Ha, that's funny you thought their yogurt was tart! Maybe because I was eating it while talking to people and wasn't really paying attention?? Thank you for treating me to an expensive breakfast!!!!!!!! !